Washington has been hostile toward North Korea throughout the entire post-WW II era because of its sovereign independence – not for any threat the country poses. The DPRK never attacked another nation throughout its entire history, threatening none now. Unless provoked to believe its security is gravely threatened, there’s isn’t the remotest possibility it would attack another country. If Washington and the West had normalized relations with Pyongyang, respecting its sovereignty, its leadership never would have pursued the development of nuclear and intercontinental ballistic missiles. They’re solely for defense against a genuine threat posed by Washington, not for preemptive war against any nation. US administrations from Truman to Trump bear full responsibility for adversarial relations – the way Washington treats all sovereign independent countries, on its target list for regime change, naked aggression its favored strategy. America’s longstanding record of endless wars against one country after another is clear evidence of the menace it poses – to North Korea, all other sovereign independent nations and humanity. In the run-up to the February Winter Olympics, Pyongyang extended diplomatic outreach to Seoul, reciprocated in kind. On Monday and Tuesday, North and South Korean officials met in Pyongyang, the first high-level talks between both countries in over a decade, discussed in a same-day article. An April summit was announced between Kim Jong-un and Moon Jae-in, details to follow. 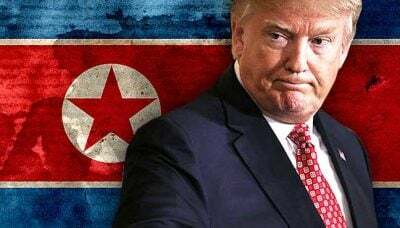 Both countries want peace, Washington’s rage for war and regime the major obstacle to ending decades of brinkmanship on the Korean peninsula. The DPRK expressed willingness to denuclearize if guaranteed security, a near-unattainable objective given unrelenting US hostility toward its government. Earlier Pyongyang diplomatic efforts were undermined by Washington, DPRK leadership falsely blamed, the way US administrations operate. Dirty tricks, double-dealing, and other deceitful actions are longstanding imperial tactics. Washington took an initial step to undermine efforts between North and South Korea to normalize relations. New illegal US sanctions were announced, likely more coming, perhaps an embargo on oil imports ahead, what North Korea calls a declaration of war if imposed. The Trump administration’s phony pretext was claiming DPRK use of chemical weapons and the February 2017 killing of Kim Jong-nam – North Korean leader Kim Jong-un’s paternal half brother. The bizarre incident at Kuala Lumpur’s airport was captured on security camera videotape for the whole world to see – an obvious red flag. Malaysian authorities said he died from VX poisoning, a banned lethal nerve agent. At one time, he was considered heir apparent to his father, Kim Jong-il, later exiled in 2003 after falling out of favor with the ruling authorities. An anti-North Korea media blitzkrieg followed his killing. No credible evidence suggested he planned returning to challenge Kim Jong-un’s leadership. He was an obscure figure. What possible motive could North Korean authorities have had for wanting him eliminated – let alone by public execution, providing red meat for US-led Western vilification of its government. At the time, senior North Korean representatives were preparing to come to New York to meet with former US officials, a chance for both sides to discuss differences diplomatically, hopefully leading to direct talks with Trump officials. Why would Pyongyang want Kim Jong-nam killed at this potentially sensitive time, knowing it would be blamed for the incident, talks likely cancelled – precisely what happened! Pyongyang denied involvement in Kim Jong-nam’s death. Its government is still unjustly blamed for what happened. An opportunity for possible DPRK/US thaw was lost. New US sanctions on Pyongyang come in response to a North/South thaw, including an April summit between their leaders. Clearly it’s a Trump administration attempt to undermine stepping back from the brink on the Korean peninsula – wanting longstanding hostility toward the DPRK unchanged, its government falsely blamed for unacceptable US actions.